Court reporting is an honorable profession with an illustrious past and an exciting future. With the rapid advancement of technology, court reporters are needed even more today than when the Sumerian scribes began preserving the record in 3500 B.C. 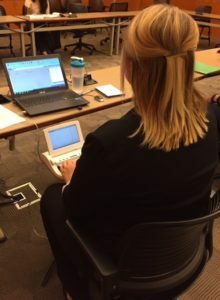 Today’s court reporters are highly trained, tech-savvy guardians of the record who are able to stream realtime* over the web simultaneously to parties participating in depositions at locations all over the world, and to provide broadcast captioning or CART voice-to-text instant visual displays of breaking news, seminars, sports, conferences and other events for hard-of-hearing persons. No machine, electronic recording or app can replace a live court reporter! Since 2008, I have provided real-life internship opportunities for reporting students and new reporters in dozens of reporter-of-record mock deposition and mock trial events at law schools, law firms, courthouses and private venues throughout the greater San Francisco Bay Area. — Law students and attorneys benefit from a reporter interrupting them to ensure the integrity of the record when they mumble, speak too fast or talk over one another. Later, by reading my interns’ rough draft or final transcripts, they learn how to improve their questioning and defending skills and future performance. — Reporting students and new reporters are able to overcome fear, nervousness and anxiety; learn how and when to interrupt; develop self-confidence; the benefits of working with a team; and to immediately utilize the lessons from these extra-curricular practical skills events in their training and career. Individual and group coaching provide insights, tips and solutions. Effective coaching processes help to build resilience and gain confidence. See my Coaching page for more info! Would you like to expand your professional skills in a real-life setting? * Realtime is the instant transcription of a reporter’s shorthand into English, visible on attorneys’ standalone computers, laptops, tablets or smartphones. **Unlike shadowing, you are THE REPORTER at these mock events. Download your copy of my e-book, 0-225: Your Guide to Writing Mastery. Participate in my 5 Golden Rules to Steno Mastery course. Top left: Photo of former reporting student, Jamie Leigh Davis, CSR 14209 at the BerkeleyLaw Fall 2016 Deposition Skills Training course. Top right: Graphic of Sumerian Scribe from The Gallery of Shorthand. 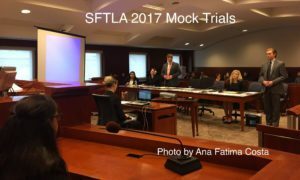 Bottom right: Photo of former student, Sarah Seitz, RPR, CSR 14175 at San Francisco Trial Lawyers Association 2018 mock trials. Photos copyright Ana Fatima Costa. All rights reserved.